Duckweed species (Lemna minor) are small aquatic plants that thrive floating on the surface of ponds and other stagnant water. They are highly successful at removing mineral contaminates from water. Duckweed is also used in fish food for such species as koi. It is being added to poultry feeds as a vegetable protein. According to the Centre for Duckweed Research & Development at the University of New England, tests are underway to utilize duckweed in feed for other ruminate livestock. Growing duckweed is relatively easy but care must be taken not to damage the delicate plants. Fill a large bucket or plastic container with the pond water that the duckweed is currently growing within. The duckweed does not require sterile water conditions if being grown for home use. You will have the best success growing the small plants using the water from the environment they are familiar with. Skim the top of the pond using a lightweight net material such as the fabric used to make wedding veils, according to the Missouri Botanical Society. Gently skim the water to remove the duckweed using the veil, then lift it carefully from the pond. Choose a location to place the bucket that offers direct sunlight. Duckweed requires six to eight hours of light per day. The plants can also be grown in a sunny window or under a skylight. If there is no area that affords warmth and access to sunlight, then consider using a fluorescent light fixture. Use one cool white tube fluorescent light and one grow light fluorescent light tube suspended above the plastic container. Watch the water bucket closely for water evaporation. The duckweed will need to be placed in fresh pond water as evaporation occurs. Topping off the water will make the water's salinity increase and can kill the duckweed. Replace the entire water content with new water to maintain the ideal water-to-mineral balance. Fertilize duckweed using an organic chicken manure tea fertilizer that can be purchased at hydrophonic garden supply stores or aquatic plant stores. Mix at one-quarter the recommended strength on the label, and apply once per week. Duckweed can successfully be grown using Hoagland's medium. 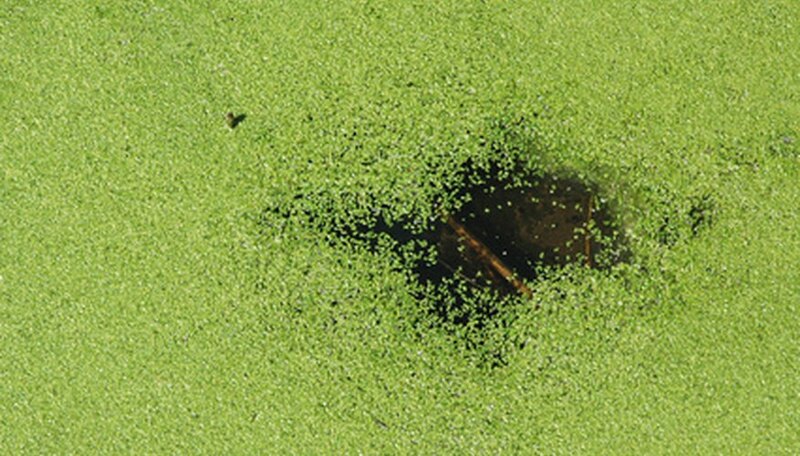 When handling duckweed, use a bacteriological loop to prevent damage to the delicate plants. Duckweed can be purchased from aquatic plant dealers. Duckweed should be sterilized before placing it in an aquarium setting. Use potassium permanganate. Scoop the duckweed and soak it for 20 minutes in the solution.